Students who start the medicine program in 2019 will graduate in 2023 with a Monash Bachelor of Medical Science and Doctor of Medicine degree. Monash made the transition to medicine course on the basis that current requirements in medical workforce require higher level of research skills and critical thinking as well as greater emphasis on patient safety. 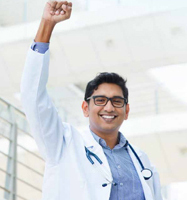 Monash medicine course was designed in close consultation with doctors, health care professionals, and leaders in the health and research sectors to provide the scientific background and clinical expertise to ensure that Monash Medical graduates are prepared for their future as a competent doctor. Bachelor of Medical Science and Doctor of Medicine at Jeffrey Cheah School of Medicine and Health Sciences, Monash University Malaysia is a five-year undergraduate medical course designed to deliver an equivalent program to that of the Australia-based Medicine program. The entry criteria, learning outcomes and the assessments including marking standards are the same as those in the Clayton campus in Australia. After completing the program, students will be awarded the Bachelor of Medical Science and Doctor of Medicine by Monash University. The course has received accreditation from the Australian Medical Council (AMC), making it the first medical program fully conducted in Malaysia to be accredited by a foreign medical accreditation council. It is also the first medical course taught fully outside Australia & New Zealand to be accredited by the AMC. This means that Monash Malaysia Medical graduates will be recognised to practice in Australia without having to take an additional qualifying examination. All students will undertake Years one and two at the 12-acre campus in Bandar Sunway. Years three to five will be based at the Clinical School in Johor, with clinical studies centred at the Sultanah Aminah Hospital, a tertiary and referral hospital in Johor Bahru, the southern-most point of the Malaysian Peninsula located just across the causeway from Singapore. In the early years of study, the basic medical sciences are taught in the context of their relevance to patient care. Later in the course, clinical teaching builds upon and reinforces this strong scientific foundation. An emphasis on clinical communication skills and early clinical contact visits to medical practices, community care facilities and hospitals, is a feature of the Monash course. The entire medicine course is completed in Malaysia, with the exception of three months in the final year of the program, where students will be trained in clinical settings in Australia. Students who have successfully completed at least the first two years of this undergraduate medicine course at Monash University may also have the opportunity of studying for an extra year for Bachelor of Medical Science (Honours). During the 12-month period required to complete the BMedSc(Hons), students undertake research activities and complete a minor thesis. They may then graduate with both the Doctor of Medicine and Bachelor of Medical Science (Honours) after six years of study. The medicine program is a highly integrated course with the objective of developing skills in critical thinking, self-directed learning, reflection and professionalism. Basic medical sciences are introduced in the early years while clinical exposure and skills training occurs in the later years. There is a strong emphasis on clinical communication skills and early clinical contact visits to medical practices, community care facilities and hospitals. Find out more information and entry requirements for this course. The Young Scholars Program (YSP) offers unique experiences to the most outstanding aspiring medical students even before starting the Bachelor of Medical Science and Doctor of Medicine course.